Abu Dhabi National Oil Company (Adnoc), has signed a memorandum of understanding with the Linde Group to explore the expansion of nitrogen facilities in Ruwais, Abu Dhabi, to meet future industrial demand. This represents a continued commitment to joint business development by the two partners under the auspices of the joint venture, Adnoc Industrial Gases, established 10 years ago. As a first step under the agreement, Linde will carry out a front-end engineering and design (Feed) study for new Air Separation Units, which are intended to satisfy the expanding nitrogen requirements of Adnoc’s gas processing, petrochemicals and refining businesses. Further steps will follow as the two companies grow together to meet expected demand for industrial gases from Adnoc’s Downstream businesses. The agreement was signed by Abdulaziz Al Hajri, downstream director at Adnoc, and Bernd Eulitz, member of the executive board of Linde AG, in the presence of Dr Sultan Al Jaber, Minister of State and Adnoc Group CEO and Prof Dr. Aldo Belloni, CEO of the Linde Group, on the sidelines of the Abu Dhabi Petroleum Exhibition and Conference (Adipec). "In line with its 2030 smart growth strategy, Adnoc plans to expand and diversify its downstream refining and petrochemicals activities, while also optimising efficiency and costs. As part of our strategic plan to increase volumes of industrial gases, the Ruwais Air Separation Unit Project will be carried out in two phases, each with the capacity to produce 70,000 cu m per hour of nitrogen," said Al Hajri. 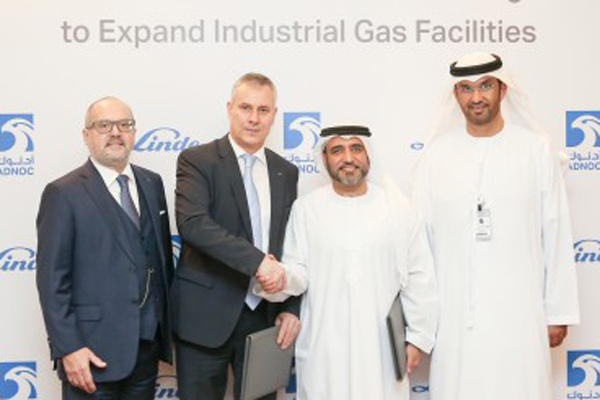 Eulitiz said: "With this planned capacity expansion, Linde and Adnoc further strengthen their commitment to working in partnership to ensure Adnoc’s industrial gases supply for its growing demand in Abu Dhabi, and creating value for both companies." Adnoc Industrial Gases is a joint venture between Adnoc (51 percent) and Linde (49 percent). It produces gaseous nitrogen, liquid nitrogen and liquid oxygen at its sites in Abu Dhabi.